Originally scheduled for Saturday, January 31st, Delcastle Golf Club will host its 32nd Annual Ground Hog Golf Tournament in what promises to be interesting conditions on Saturday, February 7th. The event was moved because of dangerously cold weather and wind chill. The tournament, traditionally played in the frigid Delaware winter, vows to trudge through despite rain, snow, or shine. After playing in 8 inches of snow last year, the forecast for Saturday calls for partly cloudy skies and temperatures in the mid 30’s. 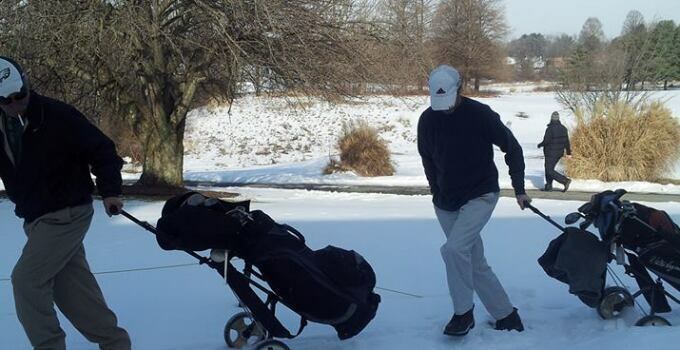 With snow usually on the ground in Wilmington, players pull their clubs (and beers, of course) behind them in sleds as they slush through the elements.